It appears we get to open our doors and windows a few weeks earlier than usual this spring. With the mild winter we experienced as well as the unusually higher temperatures the last several weeks, transitioning into spring is on everyone’s mind. Not only does that mean searching for lighter clothing options, but in many households with colder winters it means cleaning the home to welcome the warm temperatures. One might be tempted to reach for cleaning products off of grocery store shelves. That’s okay, as long as they are not the toxic/chemical laden products that shout out to us with promises of doing this and that. By purchasing some basic ingredients at the grocery store you can make all of the recipes to follow to create natural cleaning products for your home. You might also find them to be more economical as well. I have selected some of the following recipes from Natural Home and Garden’s March/April Issue. 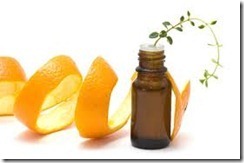 essential oils – available at health stores, my favorite oils are Young Living Essential Oils. (contact me if you would like to purchase this brand). Make sure that you purchase pure oils and only use what the recipe calls for, do not add more – it will not make the formula stringer, if anything it may cause skin irritation. Common ones used for cleaning are citrus (grapefruit, orange, lemon or lime), rosemary, eucalyptus, tea tree, thyme, citronella and peppermint. vinegar – purchase vinegar labeled grain alcohol or neutral grain spirits, you want to avoid buying one with petroleum byproducts. Combine washing soda, baking soda and essential oil in an airtight container and shake well to blend. Sprinkle a small amount in the sink and scrub with a damp sponge. Rinse the sink with vinegar, then with hot water. For stubborn stains, allow the formula to sit on the stain for several minutes, then scrub and rinse with vinegar and hot water. The wonderful lemony/citrus aroma is not only great to smell but it has benefits as a natural degreaser. Fill a clean 22 ounce bottle with castile soap (dilute according to directions if using concentrate). Add the essential oils and extract. Shake bottle before each use. Add 1-2 tablespoons of liquid to dishwater and wash as usual. Combine all ingredients and store in a sealed container. To use, add about 2 tablespoons to the soap compartment of your dishwasher. If you find your glassware has a residual buildup, reduce the amount in each use to 1 1/2 tablespoons. Combine all ingredients in a spray bottle and shake well. Spray on surfaces and wipe clean with a damp cloth or sponge. Instead of using paper towels to wipe up spills or clean counter tops, store multiple squares of cotton cloth (old T shirt or pajamas). Fill a container with all of the ingredients (you may want to use a large glass jar), shake when ready to use, pull out a cloth, ring excess liquid back into jar and wipe surface. The cloths can be washed and returned to jar for reuse. Cap jar between uses. For very greasy dishes, add 1/2 cup vinegar or lemon juice to dishwater. To loosen baked-on foods from pots and pans, immediately add some baking soda to the dirty dish and wait 15 minutes before cleaning. If the pan has cooled before you have had a chance to add the baking soda – boil a solution of 1 cup water, 5 drops cedar (or other essential oil), and 3 tablespoons baking soda directly in the pot or pan. Allow mixture to stand until food can be scraped off easily. 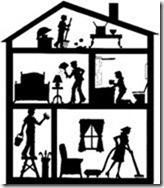 Ants – wipe cabinets with a damp sponge and 6-8 drops of peppermint or citronella essential oil. Then place 3-5 drops of the same oil on window sills, doorway cracks and in the corners of cabinets under the kitchen sink. Centipedes, Earwigs and Silverfish – Place several drops of peppermint, eucalyptus or citronella essential oil in the areas that collect moisture – basements, garages and cabinets with plumbing fixtures. Mice – place sprigs of fresh peppermint between pantry items in your cabinets, or make a solution of 2 cups water and 3 teaspoons peppermint essential oil and spray it wherever you find mouse droppings. Mites and Weevils – Place a few whole nutmegs in flour containers. Other insects – place loose bay leaves in kitchen cabinets. This antibacterial spray cleaner is specifically formulated for cleaning the general surface area of the toilet, and under and behind the seat. Combine all ingredients in a spray bottle and shake well. Spray on toilet surfaces and wipe clean with a damp cloth or sponge. Talk about chemicals and artificial ingredients – let’s talk the laundry aisle at the grocery store! I can not walk down it without a sneeze attack. The fragrances alone trigger a reaction in me. I began using fragrance and dye free laundry soap years ago. I don’t use fabric softeners nor dryer sheets with fragrance. Here is a simple recipe for washing powder and some additional tips. This recipe makes enough powder to last a typical family of four for one year. You can easily reduce the amounts to make a smaller quantity for your use. Combine baking soda, washing soap and soap flakes. If using, add essential oil and mix with a whisk. Use 1/8 cup per load. Eliminate the use of fabric softeners by using 1/2 cup vinegar in the rinse cycle. Pre-treat stains with a combination of washing soda, water and baking soda. Forgo dryers sheets. For fragrance, add a few drops of essential oil to a damp rag and throw it in the dryer with laundry. 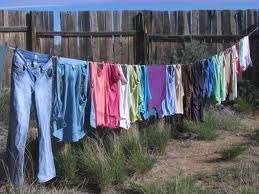 Use dryer balls (www.ecosisters.com) to reduce drying time, wrinkles and static. Make sure your dryer vents outdoors and clean out the vent periodically. Rid the washer of bacteria, soap scum and grease by running a cleaning cycle with white vinegar and hot water. NEVER combine bleach with vinegar or ammonia – it produces a toxic chlorine vapor. line dry your clothes. They smell great and don’t use any energy! Keep things simple and healthy – we are bombarded by so many chemicals and toxins, keeping our cleaning products as natural as possible within our living space is essential. If you have any questions, please feel free to contact me at design@lmkinteriorsltd.com or 978.335.1140. Happy Spring!